I switch up my everyday makeup every month or so to make sure I get use out of all my products, test new releases and switch up my routine to suit the season. As we're currently in the transitioning stage between Summer and Autumn, I have started to embrace a darker lip, as well as cracking out some of my colder weather favourites. Today I am sharing with you the makeup I have been wearing everyday this August. 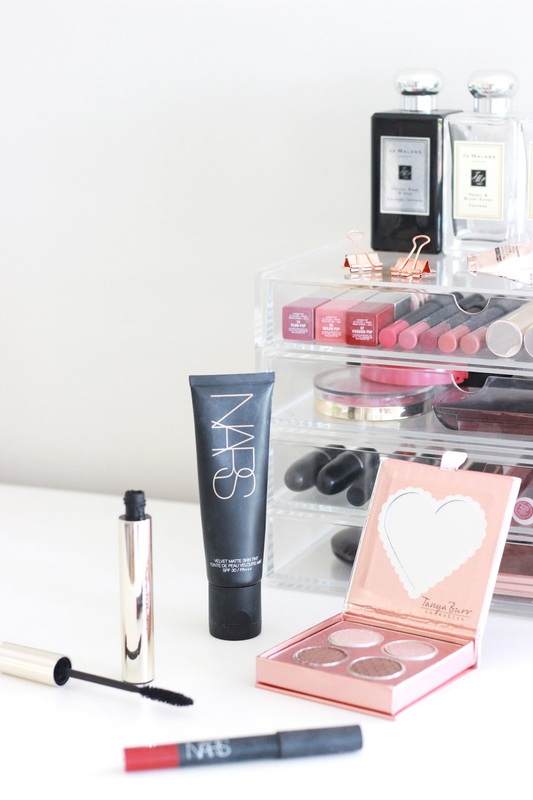 First up is base and I have been reaching for the Nars Velvet Matte Skin Tint and Nars Copacabana Illuminator combo to create a radiant base that disguises blemishes, yet still allows my natural glow to come through. I like to apply this duo using my Beauty Blender* to ensure I get a flawless finish with minimal effort. After using my usual Hourglass Ambient Lighting Powders to set my makeup, I move onto bronzer. I have been opting for several sweeps of bronzer instead of my full contour routine lately due to the changing weather. I take a dusting of my bronzer of choice and sweep it over the hollows of my cheekbones, up to the my temples and on my neck. For blusher, I have been reaching for the Milani Powder Blush in Tea Rose to add a soft pink hue to my cheeks. On my eyes I have been using the Tanya Burr Birthday Suit Eyeshadow Palette, a quad made up of versatile, everyday shades that creates an easy smokey eye. Marzipan, a champagne shimmer and Toast, a matte soft brown are the two shades that I reach for most, but if I want more definition to my eye then I like to run Soft Truffle, a matte deep brown, through my crease. To finish I have been perfecting my use of eyeliner and then applying several lashings of the Clarins Mascara Supra Volume* to add volume, length and curl to my lashes. After lusting after several shades from the Nars Velvet Matte Lip Pencil range, I thought it was about time I dug out Cruella, a vivid red to help me transition into darker lip colours. This offering is all I've been wearing lately if I haven't been wearing a light layer of my Fresh Sugar Lip Treatment. What products are in your everyday makeup routine?